When you’re a kid the countdown to summer is exciting: three months with no school to wake up for, no tests to cram for, and no heavy textbooks to haul around. But as an adult, summers can be quite the opposite: three months of activities to organize, family picnics to host, and vacations to plan. 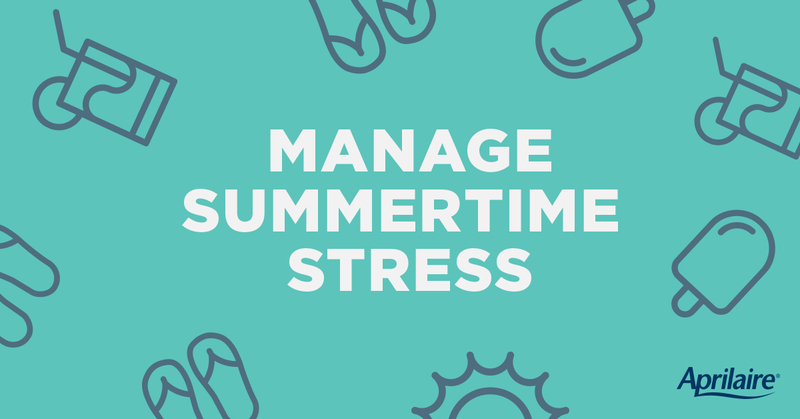 So how to manage the stress of a hectic summer and still make it one to remember? We’ve got a few ideas for you. A good night of sleep does wonders for stress levels. Try to keep wake-up and bedtime schedules the same as they were when school was in session. That will make it easier for you to plan and organize, and it will encourage the kids to do something active and exciting with their summer vacation. Spend time outside each day to soak up the sunshine and boost your Vitamin D. It’s been shown to affect mood and has other potential benefits for the body. If the forecast is blistering, try to get outside early in the morning or late at night to avoid the worst of the heat. Cash in on all your spring cleaning by having a garage sale or selling your unwanted items online for some extra cash. It’s a great way to get a jump start on your winter holiday budget. Set a firm budget and stick to it. Using only cash to pay for meals and activities on vacations is a great way to keep your spending in check. If your schedule allows, try to travel and explore on weekdays to avoid the higher weekend prices and crowds. It’s likely that you’ll have to deal with big crowds anytime during the summer, but if you’re using all of our other tips you’ll be so stress-free that it simply won’t matter. Sunshine, sand, and waves are the perfect recipe for relaxation and refreshment. Whether it’s the ocean, lake, or floating down a river, you’ll make lasting memories around the water. While you’re enjoying your time at the beach, do your part to keep the oceans and waterways healthy! World Oceans Day, a global celebration of our magnificent oceans, is focusing on preventing plastic pollution on June 8th, 2018. And it’s easy for you and your family to get involved!